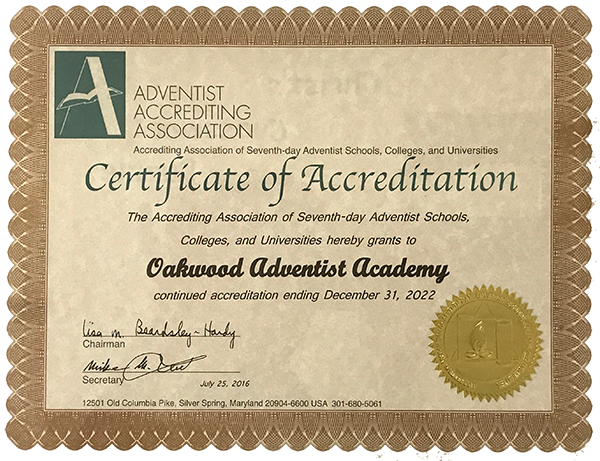 Oakwood Adventist Academy, also referred to as Oakwood Academy or OAA, is a Seventh-day Adventist co-educational K-12 school located on the beautiful campus of Oakwood University in Huntsville, Alabama. 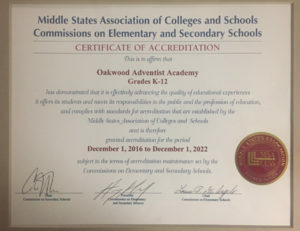 Founded in 1896 as Oakwood Industrial School, and charged with the task of training young people of African American descent, OAA recently celebrated its 120th anniversary. 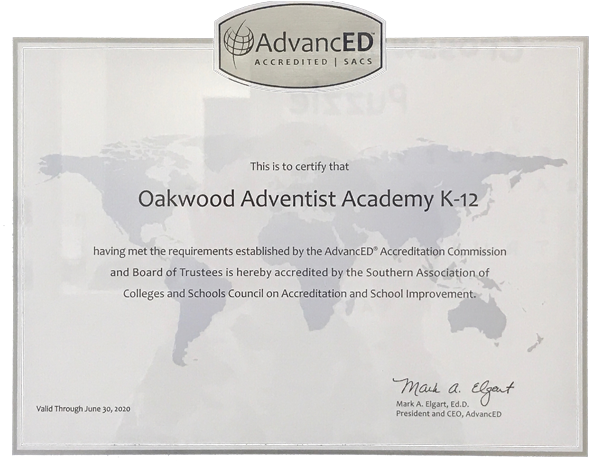 OAA is the oldest and largest Black SDA school in the United States, and one of the longest continuously operating Black private schools in the US. OAA’s holistic educational program is built to execute the mission of the school, to Develop, Nurture, and Affirm (DNA) students mentally, physically, and spiritually for a lifetime of service to God and man. 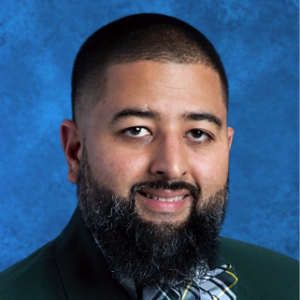 In order to achieve this lofty goal, OAA employs certified teachers who implement widely researched instructional and classroom management strategies to deliver standards-based, data-driven instruction. The school also maintains small, intimate classroom sizes throughout the K-12 program that allow for individualized, differentiated instruction. OAA has a rich history of tailoring its programming to meet the needs of the community it serves. The high school served as a boarding school and preparatory school operated by Oakwood University for the majority of its existence. 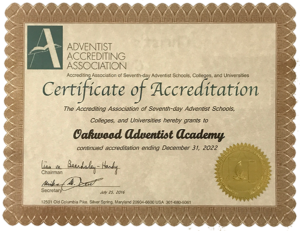 In 1974, the academy became a day school operated by a local constituency of Seventh-day Adventist churches called the Huntsville Area Seventh-day Adventist (HASDA) Churches. Today, the school is governed by the HASDA School Board and the South Central Conference of Seventh-day Adventists. 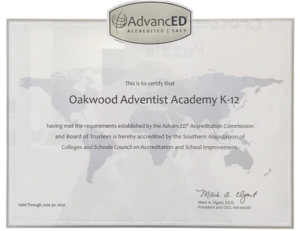 Advanced 11th and 12th grade students at the academy may participate in dual enrollment between Oakwood University and OAA at no additional cost to the academy student. Through this program, students are able to earn up to 18 college credits for free and 12 additional college credits at minimal cost. In all, students may earn up to 30 college credits at minimal cost through the dual enrollment partnership OAA has in place with Oakwood University, potentially allowing students to finish high school with enough college credits to be classified as college sophomores! OAA also offers special vocational programs: a Certified Nursing Assistant program and a Pharmacy Technician program. The elementary school, encompassing grades K-6, is housed in the Eric C. Ward Building, which was constructed in 1993 and completely renovated in the Spring of 2013. This renovation was Phase 1 of a 3-phase building project for the school. In December of 2012, OAA began Phase 2 by breaking ground on a new 28,000 square foot multi-educational facility that was completed by December of the following year. The Multi-Educational Complex, or MEC, houses a state of the art kitchen and cafeteria, a gymnasium complete with locker rooms, and a wing with four large classrooms that houses grades 7-8. Next is Phase 3, a new high school building. The high school is currently housed in the J.T. Stafford Building at Oakwood University, built in 1974, with plans to break ground on a new 9-12 facility in the very near future.